FCFD recently had Louisville Metro Police Department’s air unit out to conduct a training. We rely on LMPD to provide a bird’s eye view when we are conducting search and rescues in our rural area or in the Parklands. Their capabilities can help us shorten search times which equals a greater chance of survival for victims. 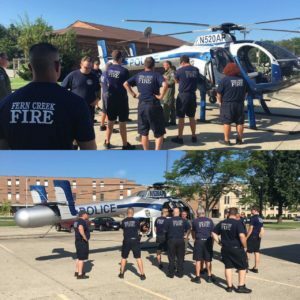 Again, Fern Creek would like to give a big thank you the The Louisville Metro Police Department and Air 20 for this fantastic training and mutual aid! ← Wreck: Fern Creek rd and Ferndale Rd.